← How to convert MS Visio documents of vsd to bmp? 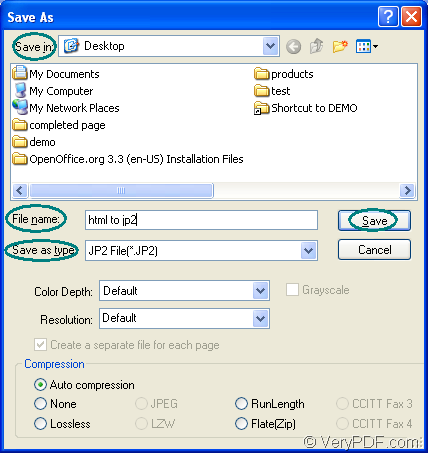 In the conversion from html to jp2, the application Document Converter plays an important role for its function of converting any printable documents to image formats. With the virtual printer application—docPrint in Document Converter, you can convert html to jp2 only in three steps with some easy clicks. You should download Document Converter for free at the following website: http://www.verypdf.com/artprint/docprint_pro_setup.exe. When you install it on your computer, you will see docPrint in the printer list by clicking “Start”—“Printers and Faxes”. Two other available applications in Document Converter are GUI and command line applications. You can see them in the installation directory. If you want to run the printer driver, you should use one of the following methods. You can right click the HTML document and choose “Print” option in the dropdown list for running docPrint directly if you have set docPrint as the default printer. Otherwise, you should open the HTML document and click “File”—“Print” to open the “Print” dialog box in which you are able to choose “docPrint” as your printer in “Printer” combo box. Then please click on “OK” button. You can also use the hot key “Ctrl”+ “P” to open the “Print” dialog box. 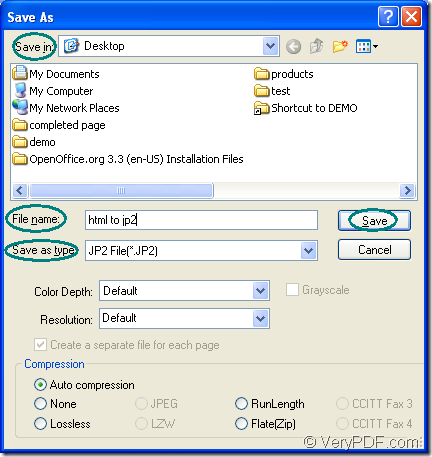 If you want to save the target file in “Save As” dialog box, you can use one of the following given ways. You can use the quick way—Clicking “Ctrl”+ “S” to open “Save As” dialog box. Or click the “Save File” button in the toolbar. You can also take the regular way—Clicking “File”—“Save as”. If you want to complete the conversion from html to jp2, you should finish the following operations one by one. In “Save in” combo box, you should find a location for the target file. In “File name” edit box, please input the name of the target file. In “Save as type” combo box, the right output format can be selected. To save all the changes, please click on “Save” button. Then the conversion from html to jp2 will be completed. Actually, the GUI application in Document Converter can be used to make convert documents to images in batch because it is good at batch conversion. The command line application can be used by software developers for developing software or for others. So according to your needs, you can choose any one of them. If you want to read more articles about docPrint to get more information, please enter the blog: VeryPDF Knowledge Base. How to print files of AutoCAD to tif? This entry was posted in docPrint Pro and tagged html to jp2. Bookmark the permalink.